If you used the SL Public JIRA (highly recommended for all Resis, it’s neat!) then you might be familiar with the various states an issue can have. But you might not really know what those states mean. What’s the difference between “Resolved” and “Closed”? When is something “Fixed”, and why do some issues seem to get stuck in “Fixed Internally” for a long time? This should help anyone who wants to make images to be displayed in the SL (classifieds, picks, etc.) and not have them be horribly stretched or squashed by Linden Lab’s inconsistent use of image aspect ratios. 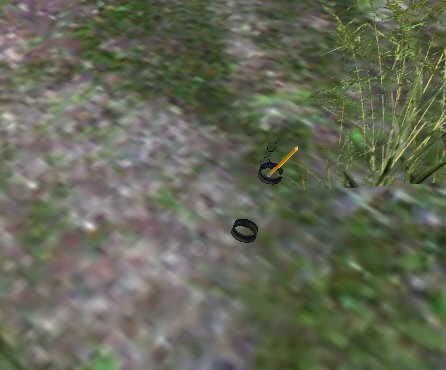 I don’t bother to cover aspect ratios for textures to be used on prims, as the proper aspect ratio in that case depends entirely on the prim’s dimensions. a classifieds listing … use 10:7.
a parcel snapshot … use 10:7.
your own pick … use 16:9.
a 2nd life profile … use 4:3.
a 1st life profile … use 1:1.
a group insignia … use 1:1.
an invitation or ‘view me’ image … use powers of 2. E.g. 64, 128, 256, or 512 pixels wide/high. Corrections? Questions? Tips? Leave a comment! Torley pointed out that Profile Picks are 16:9 (1.78:1), rather than 7:4 (1.75:1) as I had previously thought. Lex Neva pointed out that 40:28 is equivalent to 10:7. I’ve also corrected About Landmark, which displays at 40:28 (1.43:1), rather than 4:3 (1.33:1). Accordingly, I’ve changed my recommendation for parcel snapshots to 40:28 instead of 4:3, as it does not seem to be displayed anywhere at true 4:3. How to hide even more obstacles for SL photography! Vint Falken has a very good tip for SL photographers who want to hide poseballs and other obstacles from a composition without time-intensive photo-editing. Well, glorious day and jubilations, because I’ve found a way that it will work! Just toggle on `Client > Character > Character Tests > Allow Select Avatar’, and you’re ready to go! You can now select avatars and their attachments — and so, in combination with the `Client > Rendering > Hide Selected’ option, you can hide them! Unfortunately, to hide the avatar and all attachments, you have to manually select each attachment (luckily not each individual prim! ), which can get tedious! Fortunately, with the `Allow Select Avatar’ option turned on, you can just select the offending avatar and move it (along with all its attachments) somewhere else where it won’t be in your way! The movement is client-side only, so if the avatar moves (walks, turns, jumps… animation movement doesn’t count), the server will send an update to your client and the avatar will pop back into its old position. But, it should be enough to get your shot in! New “Edit Linked Parts” Menu Item! 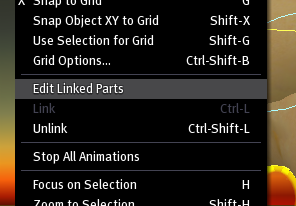 You might notice a new entry in the Tools menu for SL 1.17.1.0: Edit Linked Parts! That’s right, the feature I added back in March and submitted to the JIRA has now made its way into the official client release! The menu item works just like the checkbox in the Build/Edit floater, allowing you to switch between editing whole linked sets of prims, or editing the individual members. Not good enough? You want more? Well then how about I tell you guys how you can add your very own keyboard shortcut… in just 3 easy steps? Open the Second Life/skins/xui/en-us/menu_viewer.xml file in your favorite text or XML editor. Go down to line 695 (or do a search for “Edit Linked Parts”) where it says shortcut="", and type in your shortcut between the quotation marks! For example, to bind it to Shift-L, you’d type in shift|L! (Re)start Second Life, and enjoy! A word about the format for shortcuts: Put the modifier keys first, separated by the pipe character, | (Shift-Backslash, above the Enter key). The standard order for modifiers is control|alt|shift, but I’m not sure the order matters too much. For Macs, “control” means the Command key. HOWTO: Fight Prim Drift… with Awesomeness! In addition to being a darn spiffy development in itself, this tweak has revealed an interesting little factoid about prim position and prim drift… which I will reveal after the fold! I like to share what I learn! Open source is all about sharing what we learn! I have been helped in the past by this wonderful process, and I have found that it gives me warm fuzzy feelings inside to help keep it going by being helpful and sharing with the world! Yay! Hugs for everyone! You know that really loud and annoying typing sound? The one that plays whenever anybody starts to chat? The one that used to ruin in-world live music events? The one you muted all sound effects to get rid of? Enable the Client and Server debug menus with Ctrl-Alt-Shift-D. Type or find “UISndTyping” in the drop-down menu box. This only changes what you hear from your own client, which means everyone else will hear whatever they set. And best of all, you won’t hear typing from other avatars, either! Now that’s music to my ears!